Destination Harley-Davidson® Tacoma is a Powersports Dealer Locator certified dealer. PDL Certified Dealers want to ensure their customers are happy with their experience in purchasing a new or used bike and with every service visit. 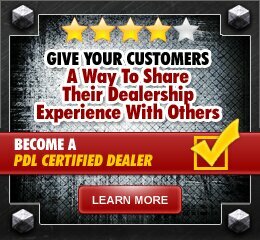 PDL Certified Dealers constantly ask for customer feedback in the form of customer reviews so they can continually improve their customer interaction and satisfaction. If you would like to provide an independent review please click on the “Submit Review” button below and we will use it to help other customers like you looking for Destination Harley-Davidson® Tacoma reviews. You guys picked up my bike back in January, unfortunately you had her until end of March waiting on Harley Davidson to ship you the part. I was a real jerk with Andrew and to his credit he explained the circumstances and then your service manager Mark explained as well, neither lost their cool. Between the two of them, they went above and beyond to please an unhappy customer. My part finally came in from Harley and they had my back running and out THAT day. Wow, that was awesome of them, they really came through and I tell everyone if you need work on your bike, call over Destination and ask for Andrew. You guys are awesome and thanks for being so nice with me after I was not very nice with you. You are appreciated and you have a customer for life! Tara is so helpful. She drops whatever she's working on to help. She offers suggestions and gives great advice. Thanks! I purchased my first Harley from Matt Flegel in June of 2012 and 7 years later in 2019 I purchased my 2nd Harley from Matt. Matt's customer service is second to none! He is patient, taking the time to understand the customer's needs and wants then takes the appropriate action to make those a reality. I would endorse Matt to anybody in the market for a new or used bike. Matt is great!! I showed up on a busy Saturday morning without an appointment. Mark dropped everything and personally came out to check out the problem on my bike. He figured out the solution, sent me to parts, and then came out and fixed it himself! It would have been easy to tell me to come back on an appointment, but Mark went above and beyond. Some of the best customer service Ive ever received! Im a customer for life. I would like to choose 5 stars for Desire - she is very welcoming, always smiling, and very helpful. Also, Candace, Matt Flegel, Ray, and Tara I love doing business with them, very helpful and welcoming. From Ed Jr on down. His whole crew makes your dreams come true and add you to their family !! Great Dealership. Highly recommended ! !